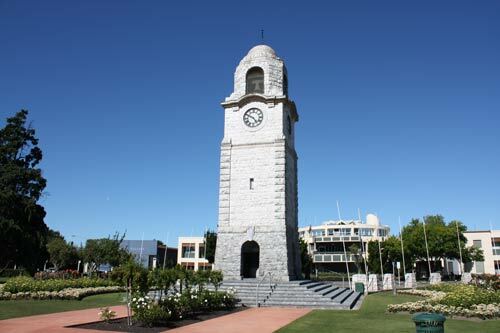 Blenheim’s 16-metre-high clock tower in Seymour Square was completed in 1928, and is Marlborough’s principal memorial to locals who died in the First World War. Stone was assembled from a variety of locations around the province – the Pukaka valley near Tuamarina, the Waihopai valley, the Awatere River, and Wharanui on the Kaikōura coast. The only stone from elsewhere is in the cross at the base of the tower, which is Tākaka marble, and the tower dome and outer circumference of the clock face, which are Australian sandstone, symbolising Australian–New Zealand cooperation in the war. Behind the clock tower are the Millennium Art Gallery (left) and the Marlborough District Council building (right).